Between 2011 and 2016, the HUI gold mining index lost about 85% and landed near 100 points in early 2016. A strong rebound occurred thereafter, increasing to almost 300 points, whereafter a consolidation phase started. The HUI currently trades at 189 points near the (green) upward trendline. If the HUI can manage to hold above this support zone and to break above the (red) resistance, a new upward trend is anticipated to appreciate towards the next (green) upward trendchannel currently at about 275 points. In case the current support does not hold, a correction towards the lower (green) trendchannel must be taken into account (pink circle). Looking at the short- and long-term price behaviour of gold, silver, HUI and the USD Index, one may recognize that an inflection point is near. Between 1980 and 2000, the gold price consolidated within the (blue) boundaries/legs of a triangular price formation. The final movement out of a triangle is called a "thrust", which by definition is either a strong up- or downward trend. In gold´s case, the thrust is clearly a strong upward movement, being still intact despite the correction of 2011-2016. Currently, the gold price holds strongly above the (green) upward trendchannel (a bullish sign). A preliminary sell-signal is generated when the price breaches this support (currently at about $1,200 USD), whereas a more definite sell-signal is given once the lowermost (green-dashed) support (currently at about $1,000 USD) is breached. As per below chart, the gold price managed to break out of the (red-blue) triangle in early 2016, whereafter a short consolidation in form of a small triangle started and is now nearing the end of the triangle; and thus forcing the price to decide on a move shortly. In case the upper (red-dashed) triangle leg can be broken, a strong buy-signal is generated, whereas a sell-signal is activated once the lower (green) triangle leg (currently at $1,200 USD) is lost as support. A thrust to the upside is poised to strongly appreciate towards the next big resistance at about $1,800 USD. Below chart shows the gold price forming a double bottom in 2015, whereafter a trend change was initiated with gold breaking above the (golden) resistance at about $1,225 USD in early 2016, followed by a typical pullback to the apex. As the price started to increase after this "classic pullback", a thrust to the upside is likely, especially when the (red) resistance is broken successfully and acts supportive, in which case a strong upward trend is anticipated. 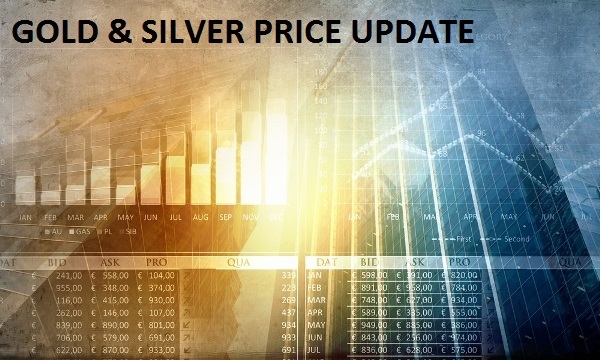 The silver price also formed a bottom in early 2016, whereafter a sideways consolidation started and is nearing completion. As soon as the price manages to break above the (red-dashed) resistance at about $17.50 USD, a strong buy-signal is generated. A strong sell-signal is given if the price falls below the 2016-low. As soon as the (red-dashed) resistance acts supportive, a strong upward trend can be expected. According to below chart, the silver price appears to be in a similar situation as in 2004/2005, when the (red) resistance was successfully broken and a "last" consolidation period took place (yellow circle), whereafter a strong upward trend followed that lasted several years. The USD Index has been on the rise since 2011. In 2014, the apex of the (red-green) triangle was reached, whereafter a thrust to the upside occurred, boosting the index from 80 to +100 points. Since 2015, the index is consolidating sideways and the breakout above the (red) resistance was not successful as the price corrected beneath this trendline shortly thereafter. Currently, the index holds above the (green-dashed) support line at 94 points (strong sell-signal once breached). A buy-signal is given if the index manages to break above the (red) resistance currently near 98 points. According to below chart, the USD Index is correcting as it was not successful in breaking above the uppermost (green-dashed) resistance. The next strong support lies at 90 points (strong sell-signal when breached). Disclaimer: The above content is not a buy or sell recommendation and there is no guarantee that any mentioned market or price will act as technically interpreted by the author. Rockstone´s authors do research and sometimes invest as indicated, however none of them is a registered investment advisor. Please do your own due diligence or consult with a registered financial advisor. As such, the content herein is of educational nature and solely represents the opinion of the author. Please read the full disclaimer here as fundamental risks and conflicts of interest exist (the author may hold a long or short position in the respective commodity or market).